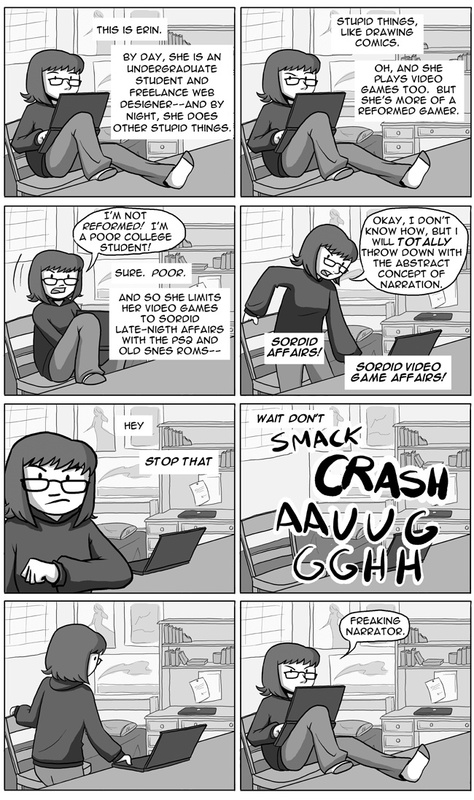 "Works in Progress" is a webcomic that explores the lives of a group of college students as they struggle through the expectations of professors, their need for artistic expression, and of course, video games. Naturally. From exploring the complex symbols of Silent Hill to the socialist mores of the blocks in Tetris, these friends have slightly erratic adventures through video games and beyond. This is a comic that goes beyond two guys on a couch and into the madness of a bunch of people being weird on a college campus. In other words, it's really something you should just read. Beautiful clean-line artwork - with backgrounds too! It might need a greater focus on video games for this contest though, but I still think it's a solid entry.